Open Chex™ cereal. Separate into 5 even parts, about 3 cups per serving. Spread parchment paper on 5 large baking sheets, or if you have the space, on kitchen counters and table for a lot of room to allow the coated mix to dry. In a large, microwave-safe bowl, melt red candy melts just until smooth. Add three cups of Chex™ to the bowl, stirring until the cereal is coated with the melted candy. Spread onto a piece of parchment paper and cool completely. Repeat for every color. Once the Chex™ Mix is fully dried and hardened, break it up into smaller pieces. 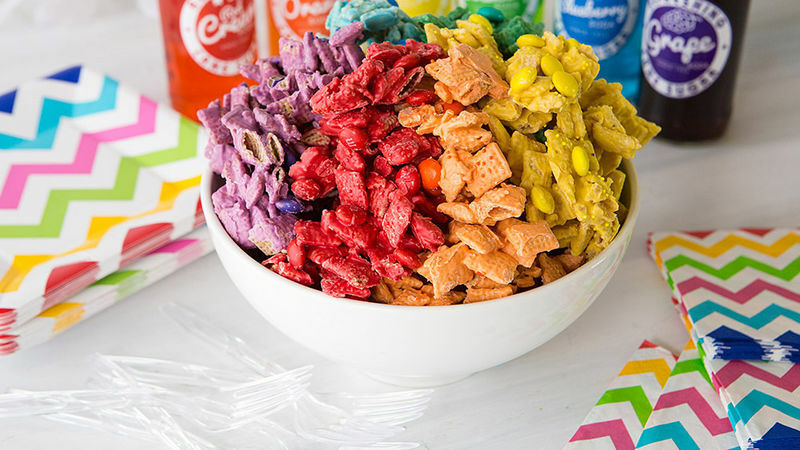 Arrange in a bowl by color, or mix it all together for a multicolored party mix. Enjoy! Candy melts can be found in the cake-decorating aisle of most craft stores. This recipe works best with a lot of preparation space. Try placing 5 large sheets of parchment paper on your kitchen table so you can work quickly, with enough space for each color of Chex™ Mix to dry at once.